Don't Make Me Get My Broom!!!! Many years ago when I was visiting my new love interest in Vancouver, he took me to the local curling club for a drink and to watch a game. I have to admit I wasn't a popular customer that day. I thought it was a joke and started laughing. The other patrons were not amused. I never could figure out the weird score board and to this day it still baffles me. Six years ago, my husband (yup - same guy) decided he was going to start curling again. As much as I dreaded it, I signed on board. I didn't want to do one more thing apart. My only stipulation - if the skip (person running our team) yelled at me, I would quit! Luckily we were put on a team with someone who couldn't have been nicer, had years of experience and was curling with his daughter. We're still curling with him today. Turns out the game is not a joke. I challenge anyone who thinks it's not a sport to try sweeping rocks up and down the ice for eight ends. Curling is like chess in many ways as well. "Reading" the ice is a huge part and strategy is an endless learning experience. We can all pity the skip who is calling a great game for a team who is missing all their shots. 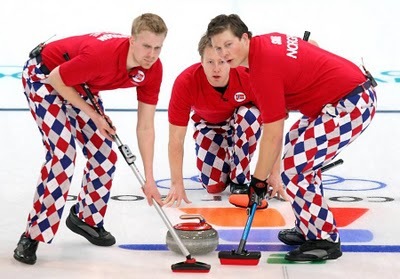 There are many things about curling that still make me laugh. I hate house cleaning at home and yet here I am once a week running up and down the ice sweeping with a "broom" in front of a 42 pound piece of granite while someone yells at me at the top of their lungs, "Sweep, sweep, harder, sweep harder!!!!" I know it's not correct etiquette, but more than once when I hear, "Harder! Harder!" being yelled around me I snicker. The scoreboard still cracks me up, too. Surely there is a simpler way. It has a horizontal line across the middle with numbers from 1 - ? which indicates the actual score. Each team throws 8 rocks to complete one end and after counting the score, puts the number of the end above the current score. That's right - you heard me. Here is a sample scoreboard with the yellow team having 7 points and the red team having 8 points. If this makes perfect sense to you and you haven't tried curling - time to call your local rink. I think it was invented by Douglas Adams myself (read previous post), but that's just my opinion. -I sweep but I don't do windows. -Don't make me get my broom. -I throw rocks at houses. -Curlito Ergo Sum (I curl therefore I am). -If Curling were easy they'd call it Hocky. -Real women curl (without an iron). -When hell freezes over, I'll curl there too. 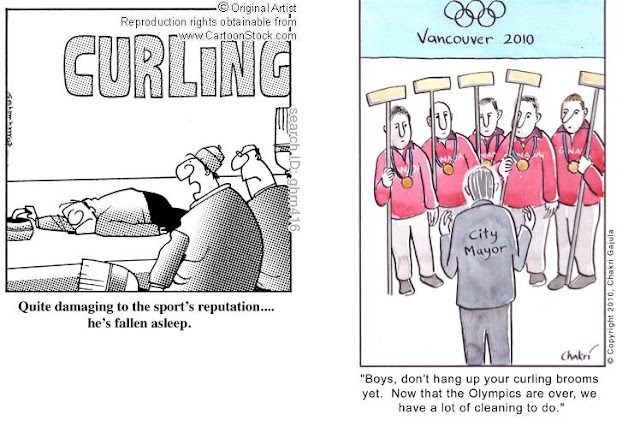 Lastly - no sport is complete without being mocked in cartoons. In closing I leave you with a couple more to enjoy.